File Can't find a hammer? It's time to organize your tools. Because hand tools usually aren't used daily, they're often lower on the list of home organizing priorities. But the thing about tools is that when you need one, you need it now. In most households, tools are not stored in just one place – some may be kept in the garage, others in the basement, a few things in a shed, and others shoved into random closets or drawers. This causes frustration when you're motivated to get something done and makes it difficult to keep track of what you own. Here are some organizing strategies. Storage location. It makes sense to keep some basic tools where you use them most. I recommend people have a hammer, screw driver, tape measure, flashlight and picture hangers on every floor of their home. Tell family members where these tools are kept and emphasize that each set is to be kept together on each floor. The decision about where to keep other tools, including larger, handheld tools such as saws, drills and other power tools and wrenches, as well as smaller pieces of hardware such as screws, nails and washers, should be based on where they will be used the most. Whether that's a shed, garage or the basement depends on where you have the space to store them safely. The tendency is often to tuck tools away in a far corner of the basement or outside in a shed, but if they're difficult to access, it makes more sense to keep them somewhere well-lit and inside. And as with all home organizing, try to have a designated space for everything. Storage options. Wherever you decide to store tools, some type of industrial shelving will be useful. There are different sizes and varieties available at hardware stores that can accommodate large tools and bins filled with smaller tools and supplies. Many also come with hooks to store saws, cords, a level, etc. Adjustable shelves will give you the most flexibility to grow into or to store other things if you don't need the whole unit for tools. Stackable bins are ideal for maximizing the space on your shelves and allowing for quick access to tools and small hardware. Label each one with its contents to ensure items are put away properly and you can see at a glance what you have. If you want to have something portable, such as a small toolbox or tool caddy, it can also be stored on the shelves and will be easy to load and unload as needed. A quick online search will turn up all kinds of nice tool chests and cabinets that look perfect for keeping everything in order, and peg boards with hooks are an old standby. But unless you or someone in your family is a serious craftsman, most people don't need something so elaborate taking up so much space. Open shelving and bins will give you the most flexibility. Painting and gardening tools. Paint supplies such as rollers, pans and painters' tape can be stored in a labeled bin. Experts recommend putting the original covers back on clean paint brushes and storing them either hanging up or lying flat. If you no longer have the original packaging, wrapping the brush in a paper towel will work. Store paint cans in places where the temperature doesn't get too hot or too cold. So not next to the dryer in the laundry room or next to the heater in a utility room and probably not in a garage or shed, where temperatures vary greatly by season. A shed or a garage are the best places to store gardening tools, given their proximity to the outdoors. Also, making a mess is less of a worry. A specified place in a basement can also work well. Tools such as rakes, hoes and shovels are best kept on hooks or in a rubber tool tower. 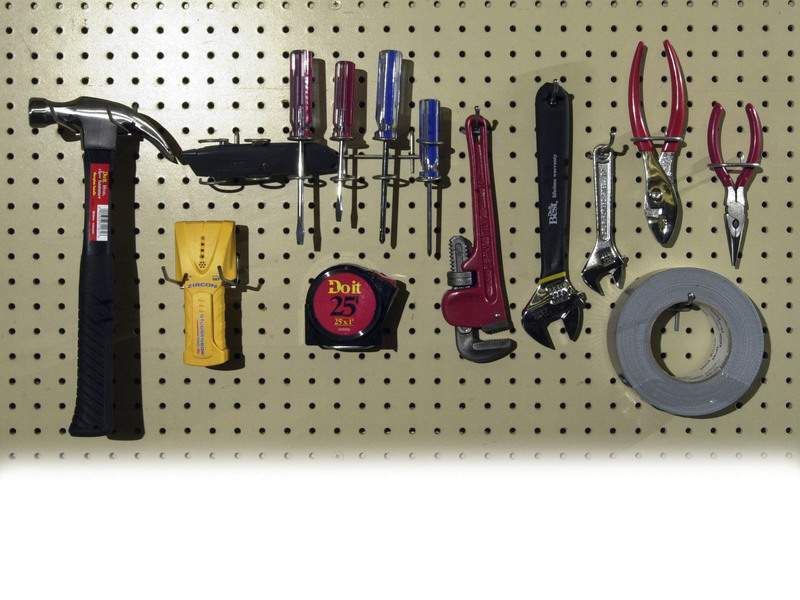 Small hand tools can be hung on hooks on a pegboard or corralled in a bucket or caddy. Seed packets will last longest in plastic bags or an airtight container. It's also best to store plant food in a closed container to keep out moisture. A large pail with a lid works well. When it comes to organizing tools, you want to be able to find what you need and know what you have. It's so hard to find the time and energy for home-improvement tasks, but if you find yourself with some free moments and feel motivated to work on a project, you don't want to waste any time searching for tools and supplies.